The name Apache Rose was inspired by the very fact that the Native Americans were some of the pioneers of statement jewellery. 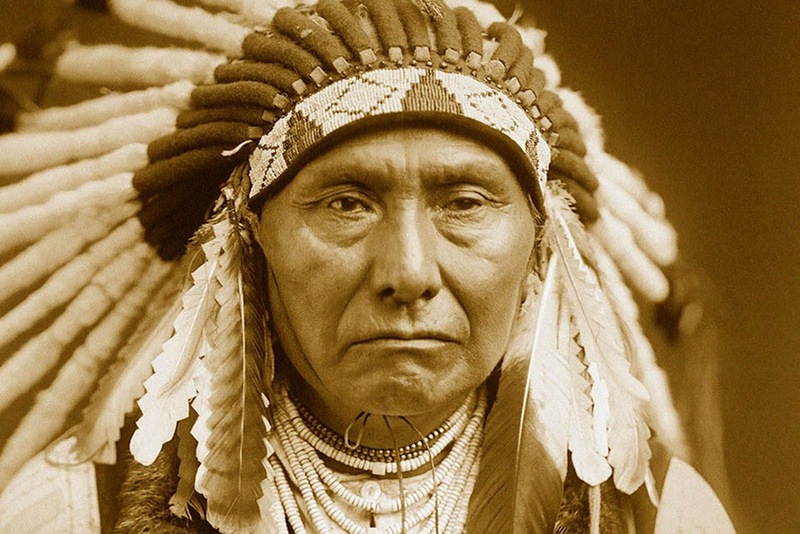 Native Americans have used jewellery through the years both as adornment and in trade. They often use stones like turquoise to make their jewellery, which is a semi-precious stone that can be found in mineral deposits in the United States southwest as well as South America and has been used for thousands of years. Archeologists have found turquoise beads dating back to as early as 200 BC. These discoveries not only show us the social status of jewellery at the time but also give us a little insight into the economic development of Native Americans. It was the Navajo Tribe that was primarily responsible for teaching the southwestern tribes how to make Native American jewellery. They learned about jewellery making when they came into regular contact with the Spanish around the 16th century. The Navajo noticed the jewellery worn by the Spaniards and how that jewellery granted them a certain status in society. They began making it for themselves. The influence of the Spanish can clearly be seen by the use of the pomegranate blossom, sometimes know as the squash blossom necklace which was inspired by the Moorish crescent. Over the next 200 years, the Navajo learned how to make jewellery and to trade with the Spaniards for their jewellery. The Navajo enjoyed using the cross or crescent shaped naja on rawhide necklaces and it became a symbol of power. It is not known when the Navajo began using silver to make their jewellery, but best estimates are that Atsidi Sani was the first Navajo silversmith and that he learned to use silver in jewellery around the early 1860s. To get silver to make jewellery, the Navajo often melted down silver coins. If they traded with the Spanish for such items as teapots or candlesticks, they would melt those as well. Although it was almost impossible to enforce the law the government passed in 1890 making it illegal to deface currency, the Navajo often turned to using silver Mexican coins as a resource. 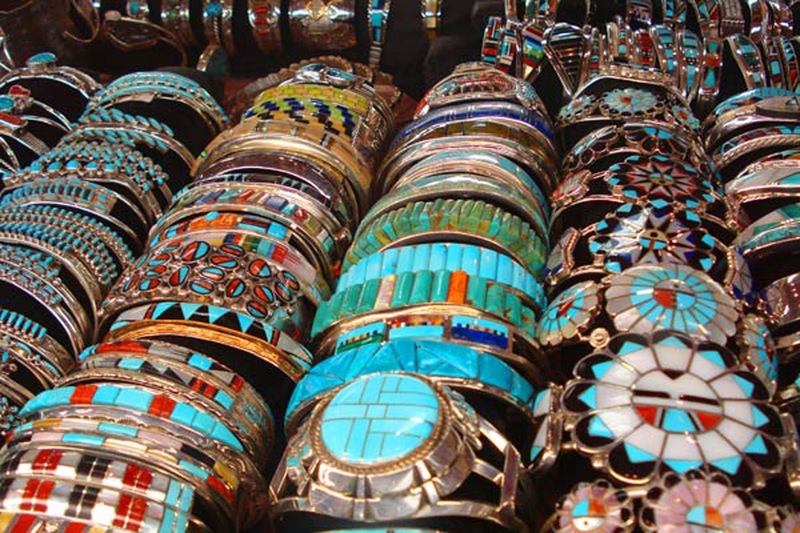 At first, the Navajo concentrated on using silver to create concha type jewellery such as concha belts, bracelets, Native American rings, pins, necklaces, and hair ornaments. Within the next thirty years, Sani had taught many other Navajo to be silversmiths and use silver in jewellery. To get the decoration on the silver, the silversmith would hammer it on with a file. The Navajo then began using turquoise, a stone very in demand and valued by them, in the 1880s. It was also around this time that the Mexican silversmiths, called plateros, began traveling to the southwest for trade. Their styles also influenced the Navajo jewellery making. By 1872, the Zuni tribe was making Native American jewellery as well as the Navajo. They were already working with copper, brass, and iron, so it only seemed natural to being using silver. Soon one of the Zuni silversmith shared his jewelry making with someone from the Hopi tribe. Each tribe began to develop its own style as they shared information. As their technique grew, they started using solder and were able to join two or more pieces together as well as set stones such as turquoise in their jewellery. As you can see, jewellery such as Native American rings, necklaces, and bracelets, has come a long way through the years.